How did the lighting controls pilot with EITC and Amatis come to be? Amatis had just started expanding into the Detroit market in August 2018, and we had the idea that we wanted to build a public demonstration site. 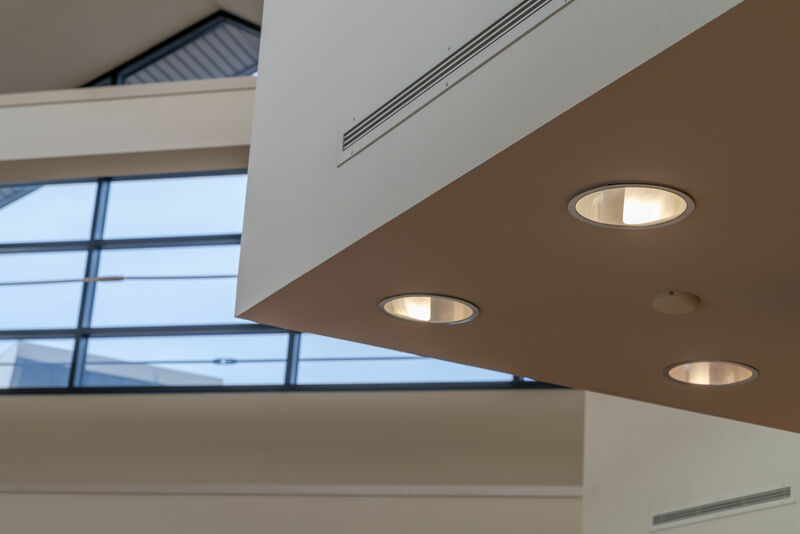 We’re on a mission to demonstrate how simple lighting controls can be to contractors, so finding the EITC, a place they are all familiar with for learning new technology was a perfect fit. We reached out to EITC and had a meeting with all of the instructors. What was the process like to plan and design the space? The controls are in the cafeteria, in one classroom, in one hallway and the tech lab, with plans to expand. We decided early on that we wanted to do per-fixture control which meant that no new electric circuits needed to be run, and that all zones could be created and customized digitally. One section of lighting (the central high bay section of the cafeteria) made sense to control as a group rather than per fixture basis. Once we confirmed those lights were all on the same circuit, and most even had 0-10V line run, we simply placed our Advanced Load Controller at the start of the circuit to control the entire branch. Lastly, we added a mesh-connected Sensor1 to a crossbeam, ~18’ above the cafeteria floor, which informs the Advanced Load Controller about occupancy and light levels for daylight harvesting. What did it take to install and commission the new lighting controls? Within one week of our kickoff meeting, we started the installation of the cafeteria zone, which only took another 10 days to complete. The installation was handled by a combination of the apprentices and instructors when they had time. Once installed, it took less than one day to commission the site. We installed controls in one classroom and the tech lab later in September, and then in one hallway in October. Was there feedback in the installation and commissioning process? The feedback was that it was very easy, taking 12 to 15 minutes per fixture to install. Doing the commissioning was exciting. We had a map already created of the different device IDs and their locations. When we logged into the AMBR, our border router, for the first time, all of our connected devices pulled up and said ‘Would you like to sync?’” That was a great feeling because it meant we were live and could start programming. What is the overall feedback on the pilot? Extremely positive. The pilot has allowed us to demonstrate our digital capabilities by customizing scenes, or motion groups, to meet the needs of the building owner. It’s allowed us to show a real-world demonstration of our system in action to its full measure and has resulted in allowing us to expand our system to many other areas in the training facility. The EITC staff likes that we’re looking out for electrical contractors. And also, they wanted to enhance their lighting controls curriculum and like that we have the latest and greatest technology which enables the contractor to take that control. One of our advantages is that our app makes it easy for installers to commission, monitor and make changes to their system locally, or from anywhere in the world with an internet connection. Can you give an overview of the Amatis system? Our system is a wireless mesh network. Connect the system with our AMBR Border Router, and monitor and control our system with the Amatis app. We have two options for fixture control – either a Smart LED Driver to retrofit fixtures or an Advanced Load Controller to enable smart fixtures. Then we have connected sensors that enable features for motion, light, temperature, and humidity. We also have battery powered or wired switches that also connect to the network. After installation, devices automatically begin communicating wirelessly to nearby devices, building a robust mesh network. Signals make their way across the mesh until they reach the border router which connects the system to the internet and enables commissioning via our app. In our system, lights are connected and able to make decisions based on experiences and inputs from any other light in the system. And by using IPv6, the same internet protocol used by your favorite websites, we’re able to give contractors direct access to individual fixtures and sensors in the app from anywhere, with an internet connection. What are the benefits of the Amatis system for contractors? We’re putting contractors back in control. We make it easy to design, quote, install and commission, giving contractors full control of the process and programming, with our support team coaching along the way. Quotes are more precise, less risky and have a higher success rate. With contractors in control of remote support capabilities, they can reduce the cost of callbacks, provide a faster response to customers and have complete control from anywhere. How has the pilot evolved? The installation has evolved to include new spaces and hopefully classrooms. We are being considered for future expansion. It has delighted the instructors. They really like showing off their system. Barry in the tech lab, Jason in the front office and through other instructors asking for when their classrooms will be updated. What can students learn from the pilot? They can learn about a new lighting controls technology, wireless mesh networks. Wireless mesh networks eliminate complexity, outsourcing, troubleshooting and range limitation, compared to wired or wireless hub-and-spoke networks. Students can get hands on experience with commissioning the network in a safe environment using our app via a smart phone or web browser. Students can also learn what not to do — there are two sensors placed in the building that don’t necessarily provide any benefit – can you find them?